The bobcat (Lynx rufus) can be identified most easily by its short bob-tail which is 2 to 8 inches long. The tail has black fur on the top and is white on the underside. It has a wide flat face with longer fur on the cheek area. It has long legs and big paws. Its color ranges from an orange-ish brown to pale gray with black spots and bars on it legs and chest and less noticeable spots throughout its body. The bobcats ability to adapt to many different habitats and ranges is what has made it such a successful species. In the Sonoran Desert is has adapted to survive on marginal habitats. A marginal habitat is one that might not be as rich in prey or shelter as other places. 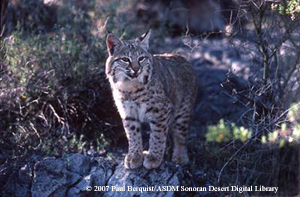 The bobcat can be found throughout the Sonoran Desert. It prefers rocky areas with plenty of plant cover, but can be found in mountain forests, riparian canyons, brushland, and in populated suburban areas. Overall, the population of the bobcat is fairly stable. In some areas their numbers are increasing and in other areas the population is declining. They are currently listed as a species of least concern. Predators of the bobcat include mountain lions, coyotes, foxes, owls, wolves, and humans. Bobcats will usually change their shelter on a daily basis. When they are not active they will rest in hollow logs, a rocky den, a cave, a low tree branch, a boulder or some other covered shelter. When the female has kittens to care for she will have several dens and will move the kittens round between them. Bobcats can live to be 13-15 years old in the wild. Bobcats generally weigh between 15 and 30 pounds. Males are larger than the females. Their body length is 20 to 50 inches. Bobcats are found only in North America. Bobcats often ambush their prey by waiting motionless and then pouncing on it. This is the same hunting technique used by the mountain lion.